This story was updated at 1:35 pm EDT. The twin rovers on Mars are in good shape today despite widespread dust storms that worsened last week and threatened to cut off solar power to the robotic explorers. Steve Squyres of Cornell University, the lead scientist for the Mars Exploration Rovers (MER) project, said that both Spirit and Opportunity are in "excellent shape" based on a radio transmission received this morning. "Both came through the weekend beautifully," Squyres said in a telephone interview. "They were both power positive over the weekend, meaning they were generating more power than they were consuming." 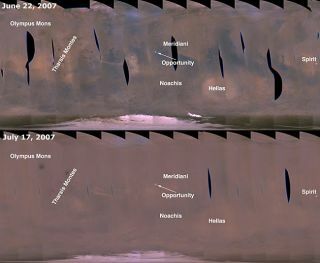 The amount of sunlight penetrating the dust-choked martian atmosphere has increased slightly in recent days, and the batteries of both rovers are fully charged, said Michael Meyer, lead scientist for the Mars Explorations Program at NASA Headquarters in Washington, D.C.
Astronomers measure atmospheric opacity in units of "tau." The lower the tau value, the clearer the sky. "At its worst, tau was a little over five [for Opportunity]," Meyers told SPACE.com. "It now has dropped down to a little less than four." The tau value for Spirit, hunkered down half a world away from its twin, has dropped slightly and is currently just less than four, Meyers added. A tau of five means that less than one percent of direct sunlight is reaching the Mars surface, but the rovers have been successful drawing power from scattered sunlight. Tau levels on Mars at this time of year when no dust storms are occurring are about one, Squyres said. Even though the rovers were not designed to weather dust storms of this magnitude, Meyers said mission scientists and engineers are optimistic the rovers will survive the dust storms, which have been raging for nearly a month now. All scientific observations and driving—including a planned descent into Victoria Crater by Opportunity—remain suspended, for now, to conserve power. Mission scientists will "wait and make sure that the storm doesn't kick back up," Meyers said. "They're going to wait it out a few more days to make sure." "Right now, we're just keeping both vehicles safe, and we've been very successful with that so far," Squyres said. "We'll just wait and see what Mars does."